4) Harmonic analysis | KOMPLEXIFY! When their digits are reversed? There’s always a prime between n and 2n. from The Space Child’s Mother Goose, (c) 1958. Come on folks let’s integrate! ‘Twixt 0 and 2, I believe. Has more rules than I’ve ever seen. On calculators, I am quite keen. ‘Cause it stays in one piece when divided. Was able to peel in a zip. Then you just get a projective plane. And a Moebius strip will appear! Poured water into a Klein bottle. Whose mouth had a funny half-twist. ‘Til she’s kissed you, you haven’t been kissed! Reduced his rapier to a disc. Had baffled the savants and sages. To the margin add 200 pages. E’en aft one more look. Oh! Seems he forgot to write the “+ C”. So he dropped math and took up divinity. Had students who thought him absurd. Meant one into one made a third. To find out why all her apple pies crumbled. The a due to gravity beckoned. Of a runner who wasn’t too bright. By red-shifting himself out of sight. And just look at the state that he’s in! To him, derivatives were okay. when she gets hold of more than one matrix. Had a very strange mission. Who taught all this calculus to me. I must retake the class. Why, we should all be so lucky. When findin’ signed areas is suitin’. Who one day used grep, awk, and sed. Now his file’s tail is its head. Here are a few limericks about this one. Equals e pi i + 1. And plus 1 leaves you nought but a sigh. The root a2 plus b2 is c.
Is approximately equal to e.
Is e to the i pi by 3. Is log (minus 1) over i. Or three bang divided by three. Is half of root 5 add on one. It’s twice exp of i pi on i. Is half of the angle at O. Feels a force of magnitude T.
To speed up at T on m, less g.
Are the same. 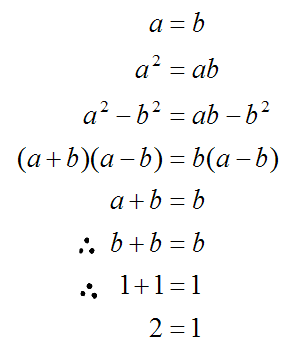 Remove b-squared. Okay? Proves that 2 = 1.
pi = 3.14159 26535 89793 23846 26433 83279 502…. Below are several more examples, listed in order of increasing decimal precision. May I draw a circle? Wow, I made a great discovery! Now I need a verse recalling pi. How I wish I could enumerate pi easily today. Yes, I know I shall recollect my number right. May I draw a round enclosure as circle known? May I have a large container of coffee, sugar and cream? To reckon right the ratios. And we can remember ‘tall. How I wish I could recollect pi. Eureka! cried the great inventor. Of radical roots, and utter “Lackaday! — Anon, Nature , vol. 72, no. 1878, (c) October 1905. Herr Planck, is fairly hard. — Anonymous extension to Sir Jeans’ famous mnemonic above. — Anon, Mathematical Gazette , vol. 4, no. 65, (c) July 1907. The decimals all of circle’s periphery. — L. R. Stokelbach, The Scientific American Supplement , no. 1994, (c) March 1914. — Adam C. Orr, Lierary Digest , vol. 32, no. 3, (c) January 1906. — Anon, The Dark Horse , (c) 1951.
and fumbling aid my present intellect gives. — Bill Powers, found in Willey Ley’s The Borders of Mathematics , (c) 1967. To figure these, you brain assessor? And no figures incorrect allow! — Aaron L. Buchman, School Science and Mathematics , (c) 1953. Dejected out of measure, reckoning blind. — John Freund, The Mathematics Teacher , vol. 62, (c) 1969.
and the greatest man of science anciently known. — C. J. Jackson, Mathematical Gazette , vol. 4, (c) 1907. Of course, the all out winner, a massive mnemonic encoding 3835 digits of pi, is Michael Keith’s Cadaeic Cadenza , a fourteen chapter collection of digit-mindful paraphrasings of entire works of literature, including Edgar Allan Poe’s The Raven , Shakespeare’s Hamlet , Lewis Carroll’s Jabberwocky , and Carl Sandburg’s Grass , among others. Not only does he manage to preserve the story, structure, and rhyme schemes of these works, but Keith additionally encodes further pi mnemonics within the text itself. For example, the twelfth chapter includes an acrostic which itself encodes the digits of pi based on standard alphabetical number assignments. While absolutely useless in helping one recall the expansion of pi, it’s a breathtaking piece of mathematical and linguistic art. but collectively it’s enough to scare Clive Barker. and yet it can be countable. when I come up with the right answer. hope that math will know. and I can listen to no one talk. And I can bid you all good day. Since I’ve said all I have to say here. I wish you luck on the examination. I hope you liked this course as much as I.
Goodbye to one and all I say goodbye. For I’ve said all I have to say here. And I can bid you all good day. #1: Ha, he asks if there are any questions. Holy smoke have I got questions! Would take him half a day to do. Much more than luck on the examination. I wish you luck on the examination. #2: Ha, he asks if there are any questions. And so my friends, I bid you all goodbye, #2: Ha, he asks if there are any questions. I hope you liked this course as much as I. #2: Holy smokes have I got questions! #3: Much more than luck on the examination. Just one more thing — and do not laugh, #1: Ha, he asks if there are any questions. I hope you’ll take the second half: #1: Holy smokes have I got questions! #2: Much more than luck on the examination. #3: Ha ha, ha ha, ha ha, don’t make me laugh. And I can bid you all good day. #1: Much more than luck on the examination. #3: Ha, he asks if there are any questions. #2: Ha ha, ha ha, ha ha, don’t make me laugh. — (c) Tom Lehrer, 1951. Download this song from Professor Walter Smith’s “Physical Revue” page. In space no intro-physics work had penciled black. Oh, I kept the first axes for another day! I doubted I should need to come back. And let them oscillate in time for ages and ages hence. According to Jonnie, this poem is about a pair of pendula, coupled together by a spring. Analyzing this problem by considering the motion the two pendula is very difficult. However, if instead we use a rotated set of axes in Hilbert space, axes corresponding to the motion of the two normal modes (the pendulum mode with eigenvector P, and the breathing mode with eigenvector B), the problem becomes much easier. Were it not that of this course it’s far beyond the scope. But you oughtn’t have trouble, ought you? The physics of both space and time, and why the butter flies. The postulates and axioms come out as theorems here. Rene from Chartres was a man who had it all worked out. He said, “I think therefore I am — of this there is no doubt! Pierre de Fermat out of France, he was a gambling man. He said “I read these books of mine to find out all I can. An apple fell and Newton saw it plummet to the ground. With its fluxions and its fluents and its dots to torment us. Bernoulli: father, son, and brother, and an uncle too. Daniel was a relative, a cousin once removed. And nothing breeds success so much as sibling rivalry! Euler did believe in God, just like his fellow man. And Diderot could not refute a proof as good as this. Joseph Louis Lagrange wrote a book full of mathematics. In English it would be the Analytical Mechanics . He said “Look high and low, you’ll find no pictures here! Marquis de Laplace did write some works on motions up in heaven. He started work when but a lad of only ten and seven. To study mathematics, or words forevermore. He went around and then inscribed a septendecagon. Cauchy and Bolzano thought that math was in a mess. Separately they sought to make it much more rigorous! Bolzano was Bohemian, and Cauchy came from France. And with their work analysis continued its advance. Evariste Galois did write the theory of the group. And with his knife did toast the King before the course of soup. And at my age been laid to rest a dozen years or more. So unto algebra I drink this next drink that I pour. Linear equations can be solved by anyone. The cubics and quadratics and the quartics have been done. Abel said “The quintics cannot likewise fall! Riemann said that parallels need not exist in space. Lobachevsky said that two or more could be in place. Cannot describe the space near massive bodies like the sun! Kronecker thought numbers should be things you can count on. To root of 2 and rationals, he said “Vile things, begone! Numbers should be whole! Let’s get rid of the reals! Cantor showed that aleph0 can count the integers. And aleph1 the reals, and aleph2 the curves. For aleph-three-or-more, we’ve got no use at all. So let us sing of aleph0 beer bottles on the wall. Creators of pathologies, like gaskets full of holes! von Neumann was a man of math, from Hungary he came. He did his work with automats and theories of the game. He said “By minimax, you might as well coins flip! The saga of mathematics has not yet in full been told. The story, it goes on and on, it’s six millenia old. And yet I fear this song, has gone on long enough. So take my glass and fill it with some alcoholic stuff…. Yes, the postulates and axioms come out as theorems here! ‘Bout the raisin’ of the wrist. Half a crate of whiskey every day! Who said, “Shall I do as I’m told? If, like me, your physics needs a little help, the three stanzas refer to fluorescent yield, internal conversion, and electron capture, respectively. Who cares what the area under a curve is? And I still don’t understand e.
I stopped by the Web at three a.m.
I’ll help your favorite charity. But Ogg, the Paleolithic Man, cross-legged in a glade. Was staring at hese pebbles like a ruminating cow. (And here he wondered) Yes, but what the devil is he at? And doubled up in merriments, his face raw-beefy coloured. “I’ve don a Think!” he bellowed “Monkey Mugg. I’ve done a think! And stared in trepidation at those pebbles on the ground. Mugg scratched his matted hairy head, not knowing what to say. are just the same according to which way you look, you see? And trod on a Batrachian that perished with a squelch. At first they would not form a neat rectangular array. That three times hand-plus-two in wives was hand-plus-two times three! While Mugg and Ogg went off to find a flat unsullied stone. First Arithmetic Theorem – by Ogg the son of Mok. That three times hand-plus-two of x is hand-plus-two times three. In search of wives and mammoth-meat, particularly wives! The haiku form is simple: a verse of 17 syllables, divided into three lines of five, seven, and five syllables respectively. The Western ear should note that the metrical unit is the syllable (Japanese is a syllabic language) and not, as in Western prosody, the foot composed of one or two syllables. The form of 17 syllables is not chance; it derives from the traditional view of Japanese linguistic philosophy that 17 syllables is the optimum length of human speech to be delivered clearly and coherently in one breathing. The three examples above were produced by online man-machine interaction at the Cambridge Language Research Unit. The program provides a frame with “slots” in which the operator types words. His choice is constrained by the lists and arrow directions in the thesaurus and diagram (below). These show the semantic center of the poem, with five arrows going to it and one going from it, is situated at slot 5. An asterisk * above indicates a double linkage. For the system to be computable, only one arrow may be chosen. Here are two haiku written by human members of the NPL. (c) Studio International, London 1968 p. 53; and NPL News 204, 10, 1967. With normal modes as vectors in a space. This inner product space holds many keys. And thus, solutions to our Diff. EQs. Indeed a daunting subject it subtends. One sees its usefulness needs no defense. Without it, where we’d be, I cannot place. Its name, known far and wide, is Hilbert Space. It’s a universal law that bodies are drawn to one another by love (or gravity). But, sometimes, a relationship (or gravitational interaction) just isn’t meant to last, and, after a quick fling, the two involved simply drift apart. And he is just a stop along her way. But it might not be enough to make her stay. It warps her world, this feeling is so vast! No matter how she tries to bend, she knows the dance is going to end. Can his warmth begin to melt her icy heart? And leave a trail of stars so bright they paint her name across the night? Or is it written they must always be apart? But she knows she’s not the type to stay too long. She has too much energy to be anything but free. I’ve got physics, who could ask for anything more? You won’t find him ’round my door. You won’t find his gold nose round my door. I got physics, who could ask for anything more? Or work cube roots with logs without mishaps. Your fractions down till they delight the eye. And, what is more, you may squeeze through, my son. — Times Educational Supplement, July 19, (c) 1947. On my darlings! Oh my darlings! Oh my darling ions mine! When just once you recombine! Is quite corking for a time. Which explains both snow and rain. Round its own magnetic line. If it’s charged with minus sign. Got the spectrum every line. In the heroic days of the Cavandish Laboratory, it was the custom to hold an annual dinner followed by home-made entertainments, usually songs at the piano. These Postprandial Porceedings of the Cavandish Society (Cambridge: Bowes and Bowes 1926) celebrate the discoveries of gas discharge phenomena and the early days of nuclear physics. Legend has it that this song was penned by J. J. Thompson, the discoverer of the electron. Each with an (n+1)-fold mate. A likely source of dividends. That lies uncut in every home. Lift up your eyes to outer space. Millions of miles and years away. Beyond the dreams of avarice. I buy a larger telescope. — (c) J. D. G. M.
From The Observatory 65, 88 (1943). For many years now, Mr. Danny Kaye, who has been my particular idol since childbirth, has been doing a routine about the great Russian director Stanislavsky and the secret of success in the acting profession. And I thought it would be interesting to stea… to adapt this idea to the field of mathematics. I always like to make explicit the fact that before I went off not too long ago to fight in the trenches, I was a mathematician by profession. I don’t like people to get the idea that I have to do this for a living. I mean, it isn’t as though I had to do this, you know, I could be making, oh, $3000 a year just teaching. I am never forget the day I am given first original paper to write. It was on analytic and algebraic topology of locally Euclidean metrization of infinitely differentiable Riemannian manifold. Bozhe moi! This I know from nothing. But I think of great Lobachevsky and I get idea — ha! ha! Haha! — begins the fun. I am never forget the day my first book is published. Every chapter I stole from somewhere else. Index I copy from old Vladivostok telephone directory. This book, this book was sensational! And you take away three, that’s nine. It won’t do you a bit of good to review math. And you take away three, that’s seven. Now, let’s not always see the same hands! Come back tomorrow night…we’re gonna do fractions! Y’know, I’ve often thought I’d like to write a mathematics textbook someday because I have a title that I know will sell a million copies; I’m gonna call it Tropic of Calculus . Inspired by “Trees,” by Joyce Kilmer. An aleph set as nice as Z. The ring of things that keeps me sane. But semigroups should know their place. Z can count the sheep to slumber. Z’s not a field, but what the care? Unlike Q and R and C.
But only God can make a Z.
Oh! The places waves go! Modeled on “Oh! The Places You’ll Go,” by Dr. Seuss. You have math in your brains. You have waves all around. You’re not on you own if you know what I know. But YOU are the one who’ll learn how these waves go. Though sometimes equations make life less hard to bear. And select t of zero so phi you will lose. And on strings and of light! The waves can take flight! Of k-over-m, (omega-s, to you). With these things in mind. And the beats mesmerizing will make you cross-eyed. A solution to this question so wide? Can you split these behaviors into left in right? Or breathing and pendulum? Or, maybe, not quite? Can you make any waveform with these normal modes? And orthogonal is as orthogonal goes. Headed, I see, toward a most useful place. A cat’s meow sound, or the phone’s shrill ring. Wherever it is waves want to go. Even the buzzing of the bees. For wasting so much paper. Yes! That’s just the thing! help us with waves on a string. Beaded? Continuous? A solution I bring! We can find all those modes. Now we’re ready for anything under the sky. And so we’ll see that waves travel and fly! Oh, the places waves go! Traveling left! Traveling right! We can find all the frequencies, even for light. The travel so easily here, there, afar. And this is the same ratio as E over B! With many strange waves as you go. Who makes things quite easy. And never mix up your right-hand rule with your left. You’re off to more Physics! So… get on that wave! Then write your equations, and start your complaints. Reduce to one variable, find the real-world domain. Then find local extrema — use calc to avoid strain! Double-check the extremum is global and you’re all done, slick. Ain’t solving optimization both easy and good fun? …Too bad I can never get ’em right. And thought that they were rather nice. And in a strange and knotty toungue. When fame was won by work alone. Achieved by counting up citations. A kind of matter directly opposed to the matter known on earth exists somewhere else in the universe, Dr. Edward Teller has said… He said there may be anti-stars and anti-galaxies entirely composed of such anti-matter. Teller did not describe the properties of anti-matter except to say there is none of it on earth, and that it would explode on contact with ordinary matter. Clasped, and all the rest was gamma rays. * At this point, the professor points to the word “minimum” on the blackboard, written in an intentionally illegible scrawl. I’m a genius and a physicist (and something of a ham). Of course, that makes me eminently qualified to teach. For anyone to say he cannot read it is absurd. Yet everybody tells me that my lectures are obscure. The sign in front is plus (or is it minus?…I forget). All these problems are quite trivial, if you only think them out. * At this point, the professor points to the word “gravitation” on the blackboard, written in an intentionally illegible scrawl. This is the paper that X wrote. Of printing the paper X wrote. Of the horrible paper X wrote. Of the odious paper X wrote. Of the pitiful paper X wrote. F answers for his magazine. Signed E1 = F2 = X3. (c) Nantwhich: Shive Publishing, 1981, 90. But I think this course underemphasizes the importance of relativity, and I would like you to hear a few words in its behalf. ‘Twas Mr. Einstein’s brainchild: relativity. You’ll know it’s largely due to… relativity.. Yes, you can place the blame on… relativity. Show Thy servant to have lied. I’m up against such competition. And print it as a Note. and T is 2 pi times the square root of L/g. ‘Cause I don’t understand a word he’s saying. Will always be a mystery to me. If I don’t get a C.
But it’s too late, I fear.There he goes again! Offer you some very good advice about the final. Don’t forget them if you’re sensible. And you can bet they’d get you soon enough. If you can’t be more original than that. They’d expel you without benefit of doubt. It’s eight-to-five that no one will find out. A great man stands to speak, and with applause the rafters tremble. It will take five thousand scholars sever years to make it live. And to help advance our program, teaching students now we’ve banned. Our motto’s integration, there is nothing left to chance. One single man remains aloof and silent in his chair. Oh, beware this epidemic Berkeleyitis, I beseech. Within the halls of NSF the panelists assemble. From all the land the experts band their wisdom to exchange. A great man stands to speak and with applause the rafters tremble. ‘My friends,’ says he, ‘we all can see that budgets now must change. By toil and sweat the Soviets have reached ten billion volts. Shall we downtrodden physicists submit? No, no — revolt! It never shall be said that we let others lead the way. We’ll band together all out finest brains and save the day. ‘Give us back our billion dollars, better add ten billion more. If your budget looks unbalanced, just remember this is war. Never mind the Air Force projects disappearing down the drain. There will be no cheap solutions, — neither straight nor synoclash. If we outbuild the Russians, it will be because we spend. Give, oh give those billion dollars, let them flow without an end. Written while the Brookhaven National Laboratory was being planned. Folklore records that the brave and solitary scientist who so vigorously defended the purity of science at the original meeting was killed by a beam of hyperons when the Berkeley Bevatron was first switched on. Download this song from Professor Walter Smith’s “Physics songs” page. Which could’ve used some enlargin’. This version was written for the July 18, 1993, Fermat Fest, held in San Francisco and presented by the Mathematical Sciences Research Institute to celebrate the fact that Andrew Wiles had proven the famous Fermat’s Last Theorem that had gone unproven for centuries. It’s a fact that you can always count upon. (c) American Mathematical Monthly , 81 (1974) 612. And their density’s one over 2 pi log(t). In locating the zeros there’s been little success. There might be a zero at some other place. We must know exactly, we cannot just guess. The integral’s contour must never go near ’em. Concerning the Lindelöf function mu sigma. On the number of zeros it gives us a grip. Is constant when sigma is more than one-half. Use R.M.T., and you’ll have better luck. Going from naught to one. Arc length they have none. I guess you’d have to run. How tough are both thy branches. To pass, what are my chances? Thy theorems I can’t master. Or find a reason God knows where. Thy problems so distress me. And running water makes me weep. They’re just an epsilon from D.
Dennis Gannon was the head of the society for Isaac Newton and an inspiring teacher at F. T. Maloney High School in Meriden, CT for 29 years. Each year at the holiday season he bellowed out Calculus Carols that he wrote for his AP students. Whose Parents weren’t on speaking terms. Both ask for some Plutonium. Laid level Ten square Miles of Land. Not to mix Science with Superstition.